This is Faubourg Marigny, a neighborhood just on the other side of Esplanade Avenue from the French Quarter, and it is to the Quarter as Barcelona is to Eurodisney. No, that's not quite fair. The French Quarter is still pretty cool, but the Faubourg Marigny is hipster heaven. Frenchmen Street has the hottest music clubs in town, and we had great Italian, Creole, and Mexican meals within a block of our hotel. Then there's La Peniche, a neighborhood joint where the after-hours crowd gathers. I've never been part of an after-hours crowd before! It was the ginchiest! 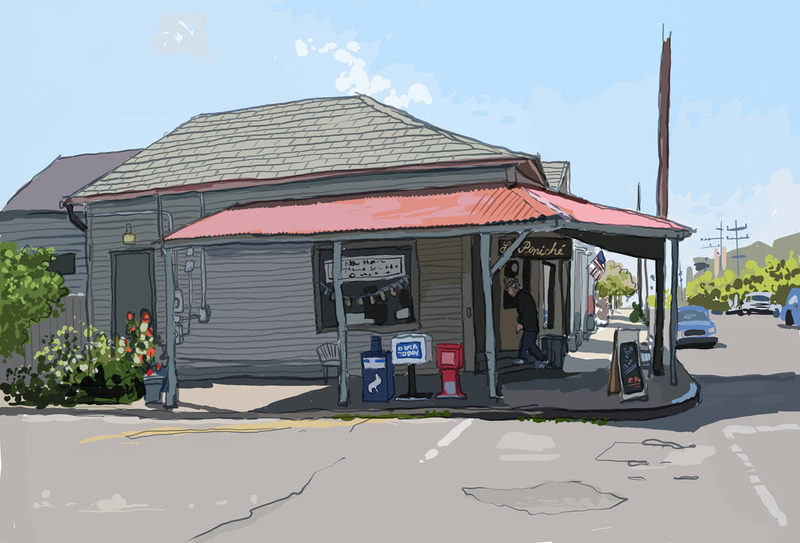 Great place for sketching characters, and Clark, our Oregonian waitperson, kept the Grand Marnier and cheese grits coming. March 31, 2010 by Walt Taylor.